CAPE CORAL, Fla. - — A recent Netflix movie called Birdbox is causing an Internet trend to emerge. People partaking in the "Bird Box Challenge" blindfold themselves and try and do daily activities, like grocery shopping or chores. But the Cape Coral Police Department is warning against it. “Not to mention driving while wearing a blindfold or blacking out your windows is not only going to be very, very dangerous it’s also a crime,” said Alan Kolak, Master Sergeant at the Cape Coral Police Department. Even Netflix tweeted about people stopping the challenge. Cassandra Louden, a Cape Coral resident, thinks the game could be fun if people were there to watch her and she was in a safe environment. “If it’s with my brother-in-law and my husband and we’re doing like in the house, controlled with somebody, maybe," said Louden. "But the whole doing while driving — that’s too much for me. That’s too dangerous. That’s just dumb." 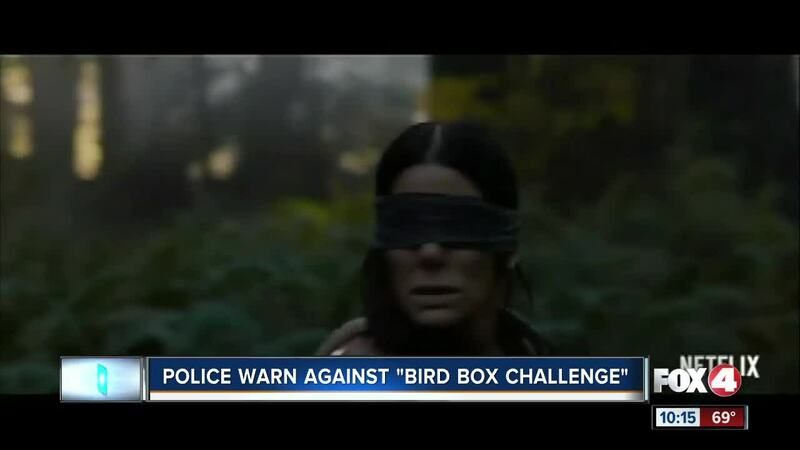 CCPD has not had any incidents regarding the Bird Box challenge but advises no one partake in this internet trend. “If you are covering your vision completely, to the point where you can’t see anything with a blindfold or eyes closed, and you actually try to perform everyday activities, you’re going to hurt yourself most likely," said Kolak.